We've known about the Motorola Moto 360 smartwatch for a few months now, but finally Motorola have launched the device officially, just slightly ahead of an anticipated smartwatch launch from Apple. This is an Android Wear device with an elegant design and a 1.56" circular display with a Gorilla Glass 3 coating and a stated resolution of 320 x 290 pixels. Inside is some sort of TI OMAP processor with 512MB of RAM and 4GB of storage. 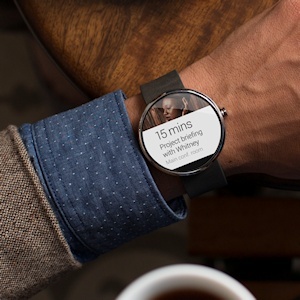 The Moto 360 supports Bluetooth 4.0 connectivity. Built-in sensors include a heart rate monitor and pedometer, and the Moto 360 is dust and waterproof to IP67 standards. The Moto 360 charges wirelessly with the charging dock supplied as standard. It weighs 49 grams and has a diameter of 46mm and is 11.5mm thick. 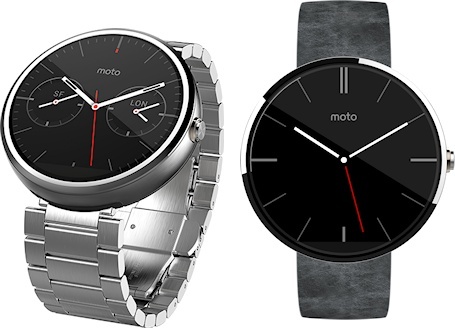 What sets the Moto 360 apart from some other smartwatches are the elegant looks. There are three standard colour combinations of either a light case and gray or stone leather band, plus a dark case with black leather. Some other configurations plus a metal wrist band will be available soon. At the moment the Moto 360 is only available in the US for $250 (the metal versions will be $300 when they launch later). That is more expensive than some other smartwatches, but this is being marketed as a premium device. Besides, an actual plain old dumbwatch can cost a lot more than that. We don't know when the Moto 360 will be available in other markets, but we suspect that some might sneak out of the US before then if you know where to look.